I have always loved manatees. When I was a kid, I left a zoo with a stuffed manatee that I still have in my old room at my parents’ house. Yet, it was years before I saw my first wild manatee. 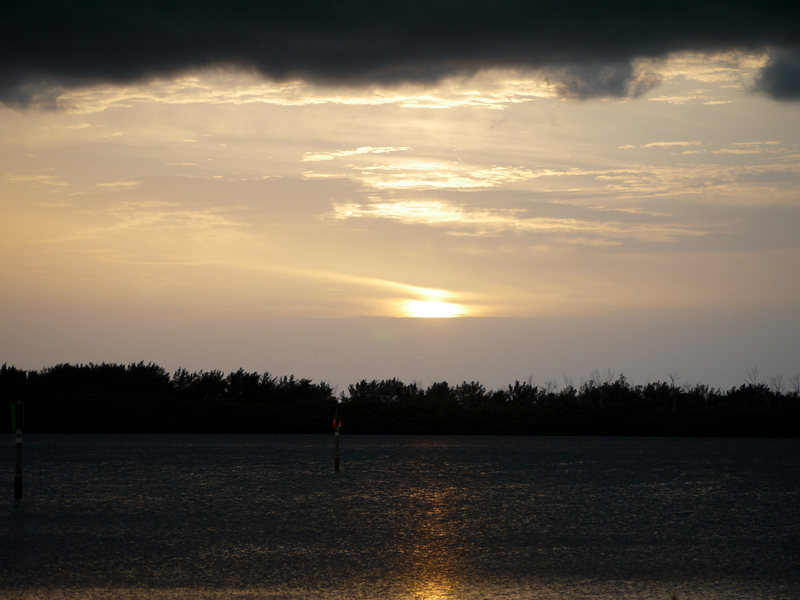 Three years ago, at 6 a.m., I stood on the edge of grass flats in the Fort De Soto Park in Florida. While I watched, the gentle giants floated past me, foraging on the aquatic plants while their backs and flat noses grazed the surface. They made little noise, and the scene was both quiet and serene. Manatees are a species faced with threats on multiple fronts. Speedboats collide with and kill them while they swim unseen below the surface, red tide reduces their population in mass numbers, and encroaching developing threatens their habitat. A recent 2014 survey indicated that there were fewer than 5,000 manatees in Florida – a population no biologist or wildlife expert would say was strong or resistant to all risks. Even with the current protections in place 829 were killed in 2013, a significant portion of the manatees alive in Florida. I couldn’t believe my eyes a few days ago. I saw online that certain groups are advocating that manatees should be taken off the endangered species list and downgraded to “threatened.” Though they would still be on the threatened list, maximum protections granted only to species on the endangered list would be lost. Who is calling for this change in status? Not a huge surprise, Save Crystal Rivers Inc, who advocate for boat owners and are represented by the Pacific Legal Foundation. What are they upset about? 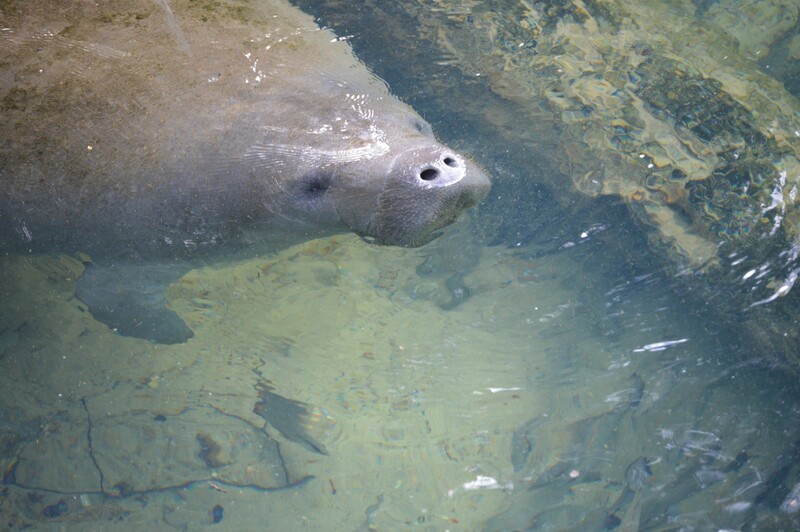 Expanding refuges for the manatees and increasing areas where boaters have to move at idle speed in order to avoid accidental collisions with the sea cows. 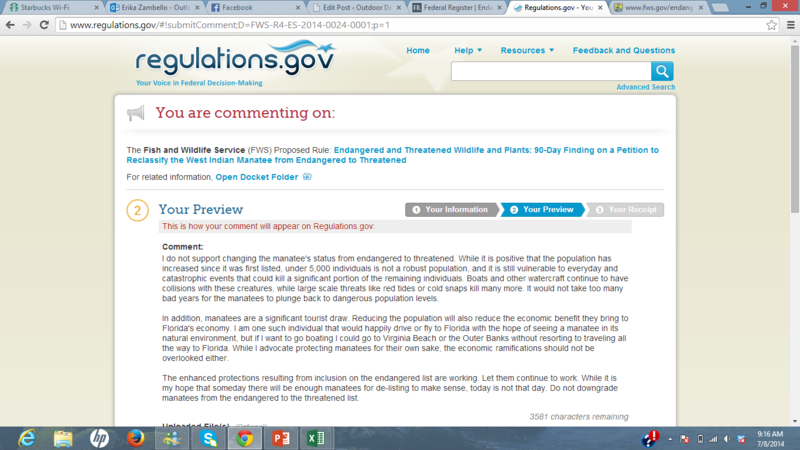 So, just so I understand: there are over 900,000 registered boats in Florida; fewer than 5,000 manatees. While there is a legitimate concern that these areas would become less attractive to recreational boaters, you have to wonder how far we will go to put our human pleasure interests over the literal survival of a historic, beautiful, and popular species. I’m a tourist. I’m not going to spend any money going to places specifically for recreational boating, but I will drive, fly, and stay in local lodging and purchase colorful postcards for a glimpse of these splendid creatures. I’m not alone, and if I do want to take a spin in a speed boat, there’s about a billion other places in Florida I could do so without the risk of a manatee collision. I’m not saying all boat owners are heartless killers – definitely not – but I believe this particular group may be missing the bigger picture. Yes, the population is increasing, so why stop a program that is working? This is an instance where the cons to an iconic species – and potential tourism draw – far outweigh the benefits to local boaters. This is also an instance where citizens can speak up and demand a just outcome. The proposed change is open for public comment from researchers, officials, and ordinary citizens just like you and me. So we should! The comment form is found here, and comments can be short or lengthy depending on what you have to say and any background information you would like to include. I have commented, and it took minutes. Currently there are only 55 comments, which are open until September 2nd and will be used in the listing re-evaluation. We don’t need more waters open to fast speedboats. We do need a healthy respect for nature and her creatures, which starts with stepping up as environmental citizens and protecting vulnerable populations. Don’t forget, we are responsible for the precipitous decline of the lovable manatees in the first place. Erika Zambello, MEM’15, is a Marine Economic and Tourist Development Resource Coordinator. In Outdoor Devil, Erika explores the natural world surrounding Duke and all the ways students and locals alike can get out and experience the outdoors as a daily part of their lives.